The Dominican nuns at Our Lady of Grace Monastery (North Guilford, CT) lost their barn this past winter with the constant snow fall. The old barn collapsed under the weight of lots of snow –it’s poor, old legs couldn’t bear the torment of heavy snow and ice. 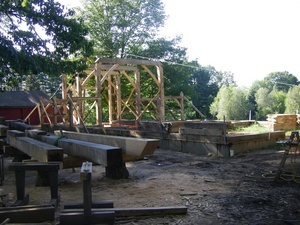 But the monastery needs a barn. 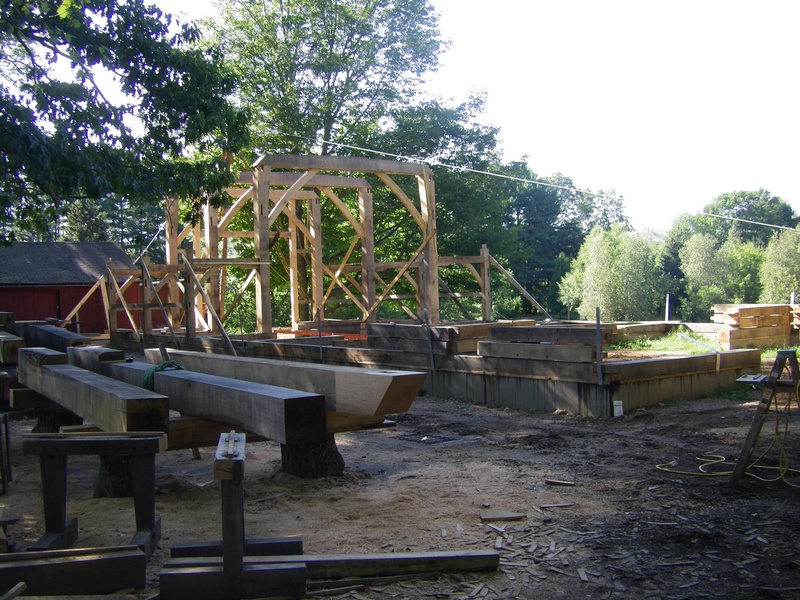 Since the nuns have no sustained interaction with the outside world due to being papally enclosed, the ever competent grounds keeper and building supervisor, Ryan, decided to build an old fashion tithe barn that’s expected to last 600 years. No nails will be used to keep the building together. And, all the wood was harvested from the monastery property and trimmed to need by Ryan and a local friend who’s graciously sharing his equipment and time. As Father Gabriel B. O’Donnell reminds, being a saint doesn’t mean that you are divested of your own personality, to have intimacy with God doesn’t mean you change who you are as a person. Domincan Father Gabriel O’Donnell is currently the academic dean at the Dominican House of Studies, Washington, DC. Watch PBS Religion & Ethics Newsweekly which helps us to understand the role of saints today. Last week at the University of Notre Dame (my alma mater) members of the various religious orders along with a secular priest, spoke about their place in the Church. In church lingo: they spoke about their charism (the diivne gift). As you know ND was founded and continues to be sponsored by the Congregation of Holy Cross (CSC) but through the years members of religious orders like the Franciscans, Jesuits and Dominicans (among others) have worked and/or studied at ND. The richness ot the women religious ought to be explored at some point. Speaking to the university was an opportunity to attend to the distinctions among the orders in a healthy manner. The Observer carried the story. Several men have committed themselves more fully to the Lord and His Church today. A Benedictine monk, a Capuchin friar and Dominican deacons took vows or were ordained. Dom John McCusker, Benedictine monk of The Abbey of Saint Mary and Saint Louis, St Louis, MO. 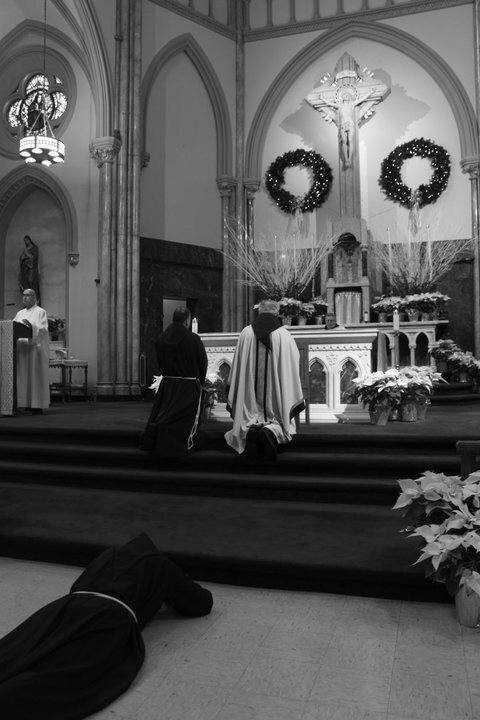 Brother Salvatore Cordaro, OFM Cap., professed Solemn vows in the Province of St Mary. The Mass and profession of vows took place at The Church of Saint John the Baptist, NYC. 5 Dominican brothers of the Province of St Joseph were ordained to the Order of Deacon. The ordination took place in Crypt Chapel of the Basilica National Shrine of the Immaculate Conception by the Most Reverend Martin D. Holley, auxiliary bishop of Washington, DC. We are exceedingly joyful for the witness of these men for the Kingdom of God. Let’s pray for them! Thanks to Andrew Skonieczny for the photo. 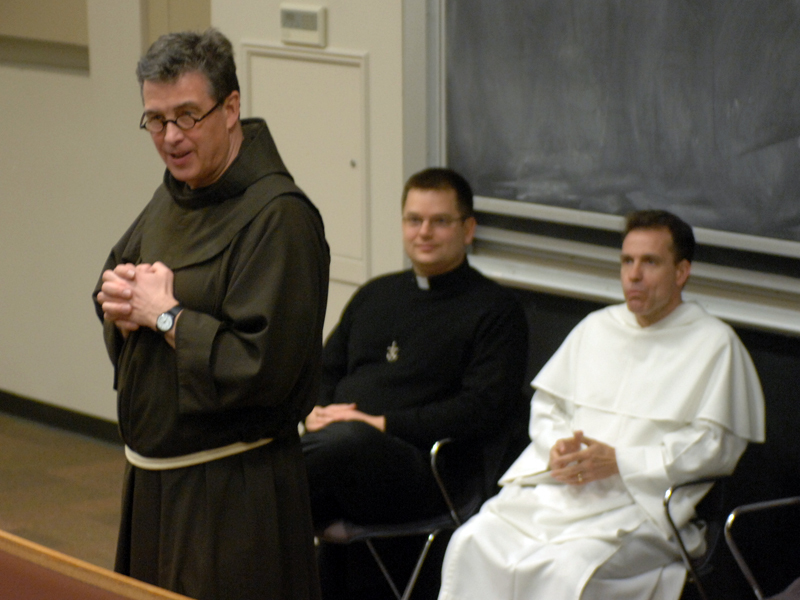 Last week the novices of the Order of Friars Preachers –the Dominicans of the Province of Saint Joseph– heard the following talk by Dominican Father André-Joseph LaCasse. Father LaCasse is the pastor of the Church of Saint Gertrude, Cincinnati, OH. I am not a Dominican but I have great affection for the Dominican vocation and many friends are of that persuasion, however many readers of this blog are not Dominicans. So, I thought after reading LaCasse’s talk there is something we can all be helped by what was said about the fraternal life the Dominican Order. In my estimation Father LaCasse’s thoughts are applicable to all states of the Christian life: the single person, the married couple, the Capuchin, the secular priest, bishop, etc. In the School of Community (of CL) we’ve been working on Father Luigi Giussani’s notion of charity and sacrifice and are about to start the section on virginity. And I ask myself: How is it that as a Christian I live in a state of perpetual discernment of faith, hope and charity through a life of sacrifice? In what concrete ways do I live honestly? Well, I’m off to confession to find that out. You?